Dried Green Split Peas - 20 lb. Enjoy the added nutritional benefits of cooking with dried peas and stock your restaurant or buffet with this 20 lb. 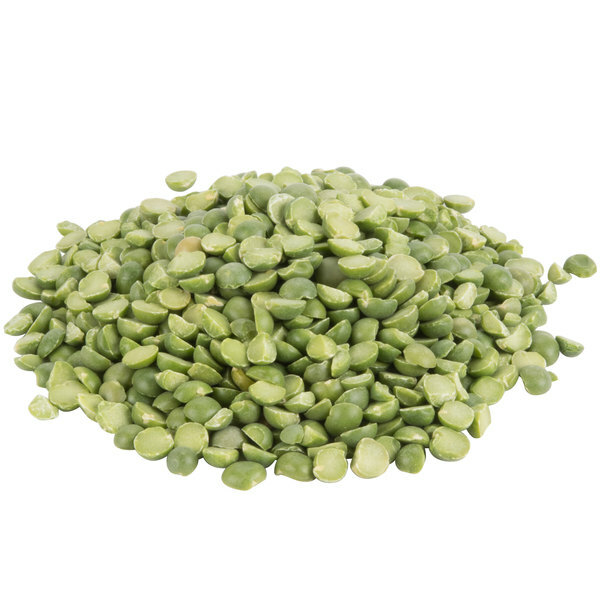 bulk supply of dried green split peas! Split green peas are a great addition to a variety of meals from split pea soup to traditional British pease pudding. In many Indian and other ethnic dishes, split green peas will add a vibrant color and subtle flavor to anything you cook them with. A flavorful source of fiber and protein, you can also add green split peas to many vegetarian dishes. Because of their long shelf life, dried green split peas are easy to store and portion. Like all dried beans and peas, these split peas require a soaking process before cooking and serving. They may take longer to cook than canned peas, but dried split peas have many advantages. These dried peas contain less sodium than canned peas, making them perfect for your health-conscious patrons. Though canned peas may seem either too firm or too mushy, your staff can control the firmness of the peas as they cook them in their own kitchen. 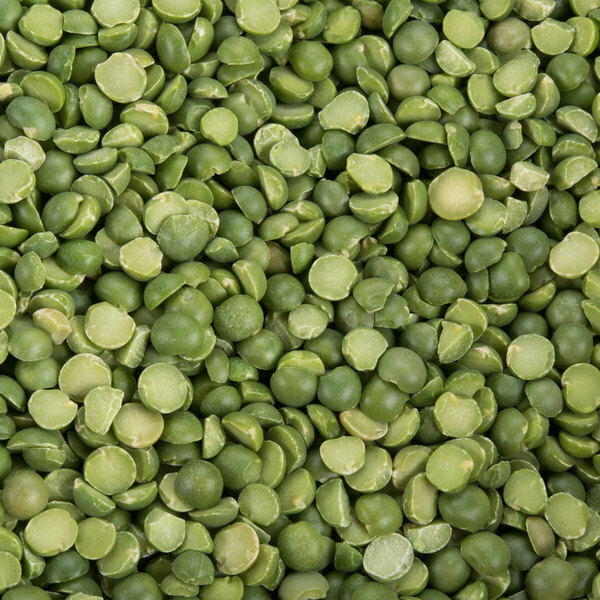 Cost-effective, these dried green split peas make a smart addition to any commercial kitchen! Overall User Rating: Dried Green Split Peas - 20 lb. Great value and good taste. Cooks with my beans in pressure cooker, making good bean soup/meal for me. I add herbs and spices with each time I cook. Split Pea soup? Yes, please. It's one of our favorites and these peas go great in it. We are pleased with the quality and the price of this product! Take off "ROTATE STOCK TO AVOID INFESTATION" off of the box ......that is a turn off when it comes to food. I would suggest to package it different (in plastic containers) and put that warning just on your shelves. Your employees will know anyway. great fresh split peas I use them mainly for soups, sometimes chicken dishes, and many other recipes that call for it, it works well, tastes fresh, and has great color! These are, of course, good for making split pea soups but are good cooked and enjoyed on their own or in many types of soups. I love making split pea soup. It is a healthy and cheap meal. These dried green split peas make great soup with a few other items and a few hours to simmer you have a great meal. The peas are great and I don't find stones o r other chaff mixed in. Great product, came just as it was described online.. Easy to use and great for creating our dry soup recipe for donation to local shelters. Do you make bean soup? These are the same commercial beans that are packaged and sold at a higher price. We love them and they taste great! Healthy for you too! These split peas are super yummy and creamy. I like to cook them with a piece of bacon and MSG to make soup. They are pea-licious! I catered my own daughter's wedding and actually used the split peas for decorative purposes. So, while I cannot speak to the taste, I can surely attest to the value. Webstaurant had the best price out there and we used a TON! Thank you Webstaurant! Green split peas are a pantry staple, the classic soup with ham a winter chill-buster. This is a can't beat it anywhere price. They store beautifully. Wow 20 lbs what a buy. And who does'nt like split pea soup. I dont try to make anything ahead so 20 lbs last us a long time. What else can you make with split peas besides split pea soup? Add a ham hock and you are good to go! Great product for a great price. The dried green split peas are great for split pea soup. The 20 pound bag is also a great deal for the money, I really enjoy this product.